Nuremberg, the Franconian metropolis with half a million inhabitants, attracts investors, company founders, scientists and artists, tourist and business travellers alike. The town can be reached from many different places. Important motorways cross here – the A3, A6, A9 and the A73. The Nürnberg railway junction directs the ICE (Intercity Express) to other international long distance routes. Due to its position on the Main-Danube Canal, Nuremberg has become the port with the greatest freight centre in Southern Germany. And the international airport builds a bridge connecting flights to the rest of the world. One of the most well known trade fair centres in Europe brings more than 20,000 exhibitors and more than a million visitors from all around the globe to the town each year. And particularly for visitors to the trade fairs, our Chauffeur Service and Limousine Service Nuremberg is becoming more and more important, one reason being that in the rush hour taxis are often difficult to get and business people don´t want to or can´t wait. Nuremberg provides an excellent transport system. It is designed to get as many people as possible to their destination as quickly as possible. However, such a public transport system cannot offer exclusiveness, comfort, convenience and service. After an often long journey, the fight for a taxi or the nerve-racking hunt for a parking lot is one of the worst possible preparations for a business meeting. To get to a business meeting stressed, hot and bothered and weary is in nobody´s best interests, least of all those of a serious business person. To arrive unhurried and stress-free, and to be picked up again at the door after your appointmentis terminated, is a service which is becoming more and more popular. Our Chauffeur Service and Limousine Service Nurnberg is the solution for the modern, self-assured business man. Comfort, flexibility and safety combined in one harmonious package. Your transfer from the airport to business meetings, from the hotel or to the station in a prestigious luxurious limousine or minibus becomes a relaxing experience in exquisite surroundings. You can calmly look through your documents again, check through some points or simply enjoy the all-round attention our well trained chauffeur gives you. 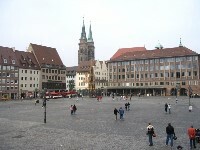 In Nurnberg there are around 150 trade fairs, exhibitions, congresses and other events each year. Many organisers are glad that they can count on the services our Limousine Service Nurnberg offers. From greeting important guests to transfers in the most comfortable luxury vehicles or even to organising complete events, our Limousine Service Nurnberg carries out every order accurately and to your full satisfaction. Our Chauffeur Service is an alternative which enables you to enjoy a stress-free exclusive sightseeing tour in your own car. No matter where you want to go, whether you wish to visit the Albrecht Dürer Museum or are interested in the collections in the Art Exhibition Gallery, whether you want to finish off the day in the „Bar Blau“ or in the „Gelben Haus“ – your personal chauffeur will take care of your every wish. In addition to Nurnberg, we also provide our services in other cities in Bavaria, including Passau, Augsburg, Ingolstadt and Munich.